Junta de Andalucía - 7. 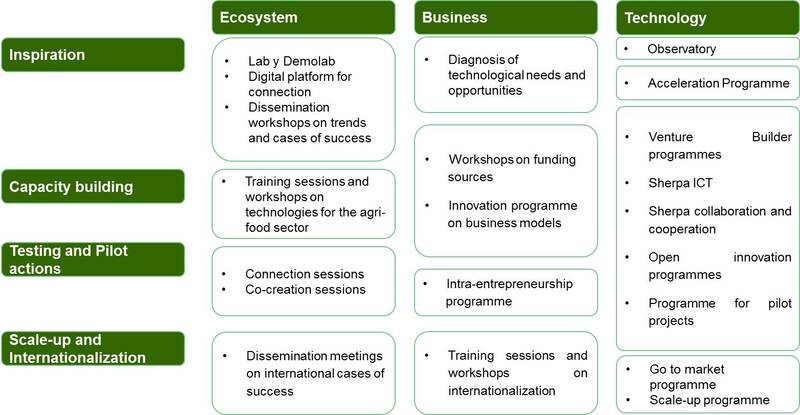 What Services does the Andalucía Agrotech DIH offer? 7. What Services does the Andalucía Agrotech DIH offer? The DIH, through its members, will offer a catalogue of services aimed at strengthening the knowledge ecosystem and improving capacities as well as developing new business forms and going further in the development of technologies. It will be also a contact point that will help regional Competence Centres (Universities, Technological and Research centres) find final users for their researches as well as platforms to test the latest technologies available. The DIH will stir this innovative activity by participating in projects and initiatives both at national and international levels, always with the aim of helping Andalusian companies benefit from and participate in them. Certainly, SMEs will be the major beneficiaries from the activity. In fact, a business space will be created for start-up companies. One of the objectives of the DIH is to act as a catalyst to enable these companies, whether they belong to the agri-food or ICT sectors, to have access to knowledge, projects and financing sources that, otherwise, they would find more difficult and costly to access them. The DIH will establish strategic alliances with other DIHs at European level in order the enable Andalusian SMEs to provide services and to access others that could exist in other countries of the EU.